“Doing Business in...” - the student can develop a business plan (export a product or service, import, investment) for this market. The objective of the subjects “Doing Business in...” is that student can develop a business plan (export a product or service, import, investment) for this market. 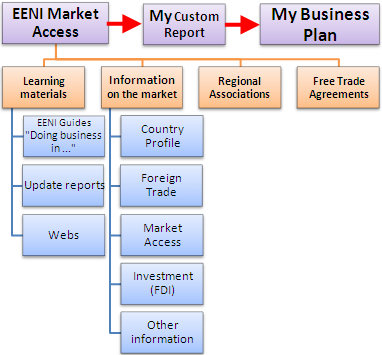 To facilitate and guide to student in developing the business plan, EENI Business School & HA University has drawn up this market access tool. The objective of this methodology is to facilitate the complex work of global research and access to export markets that any exporter should be performed continuously. Doing Business in - Market Access. Note: module two is free for all of our students and alumni. 4- Free Trade Agreements related to the country. Finally, the student must write a business plan for the target market.